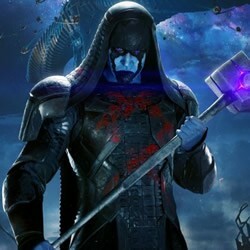 Assemble these puzzle pieces of Ronan the Accuser one of the most powerful enemies of Peter Quill and his band of Guardians of the Galaxy. You will find all your galactic favorite character puzzles and coloring pages from the movie Guardians of the Galaxy on Hellokids.com. If you like superheroes you will like the superhero and marvel channels for more online fun.